but then you need to consider how much you want it.....especially if its not coming to R4 anytime soon. i know and thats sad! And how are we all doing?? its not that hot.........Where is everyone? Plus has anyone seen any good anime lately? Watched Fate/Stay night and Shakugan no Shana recently - bet you seen those tho. o.o that the new rambo? so its worth watching then. Ah just a bit busy thats all. Shakugan no Shana was very good - well what ive seen of it. Not quite as good as fate (imo anyway) but definately worth watching plus there is going to be a second season so im told which is pretty cool oh and a movie. Finished watching Guyver finally and watched the One Piece Movie (finally uncut and dubbed) now just want the rest of the series released. Im boring and have not seen any new release movies. PS: i just got an MSN virus and now i cant use msn i'm trying reinstall and stuff but i'm having problems so sorry if i'm not around for a while. Yes guyver does get slow during parts but does pick up abit, Not as good as original OVA. I havent started watching alot of series as i usally wait till ive got the complete series. Y Not as good as original OVA. Anyone here go to Perth Mod? nope sorry i go to ECU mount Lawely along with Creep speaking of which where has he been hiding???? I've been busy with uni assignments and stuff, and moving into my dad's place. Thats mostly done, i have a break, just relying on my group to finish the group assignment. I did my part in 2 days, but then i havn't had any replies from them and the assignment is due in like 2 days =/. Is there anything else new with anyone..............anyone.................. HELLO?? I was the only one in my group thats done anything =/ the things due tommorow, don't people have brains? how is everyones weekend going??? while there isn't an I in team, by the sounds of it you've everything an theyhaven't done a thing.. I hate when people get passing grades when they don't even submit the assignment together, getting marks for others work isn't good practice, as if they repeated this in real in a business environment eventually they will get caught out and likely loose their jobs because of their stupidity earlier in life..
awww poor Creep's........I owe you one hug next time i see you (maybe) ...will that make you feel better??? Welcome to the world of uni. Its like that i'm working on my group assignment today hopefully i can get the majority of it done (well all the individual work then all i have to do is talk my group into meeting and sorting out the mock lesson/activity) then i can get backt o my important essay/novel thing lol. They are due the same day so its not to bad but i prefer to spend more time on the individual project but when the group one weigh more that your individual it poses a problem. hmmmm and i was going to ask something but i cant remember now. yeah thats exactly right. part of the asswignment has a log of which parts were done by whom but they still don't lose any marks. i would've thought they should all get zeros. i did all the work and they do nothing, they didn't even show up to class!!!!!!! arn't all assignments usually due on the same day? they should of got zero.....although your in first year so the lecturer may let them off but thats no excuse! yeah i've nearly finished my group assignment (well my part anyway), so that means i will more than likely start working on helping my other group members on theres....Since its a group thing and if they screw up it means i will suffer with a crap mark. Then hopefully later tonight if no one is here, stealing my icecreams and food....i'll do my inidividual assignment plus i hope to find time to what an anime....if not i'll cry! Whats everyones plans for the easter break? unfortunatly im a boring person who will be doing nothing but watching anime and playing disgaea 3.
so im not the only 1 thats boring. also doing nothing but will have to get this months mm releases this weekend. just hope at least Tsubasa chronicles v6 comes so i can start watching the whole series altogether as the rest i can live with waiting for. lucky you put that nearly there i was about to stop talking to you. aawww well I try to speak the truth. Why thankyou i couldnt put my other bunny girls up because they were slightly naughty. Happy Easter! 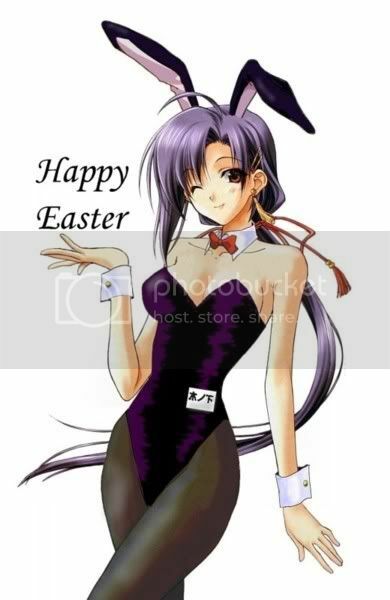 i hope everyone is having a good day and getting lots of things off the easter bunny. Is anyone here going to go to the Perth Supanova? I am, be prepared to see me dressed as Arucard!!! Welcome to the perth section! Dragonball z i'm kinda over that......What other anime do you like? Plus if Creepy goes i'll go, we can go together (i'll find the money). I'll be Kurumi or haruhi or someone else LOL i dont know.....it gives me an excuse to dye my hair back to pink. All my basketball teams are in the next round of semi finals......Even with the slight problem that occurred. Now they are watching please teacher and i'm stuck with them for tongiht LOL. I will be going to supanova, need to get Kairi figure signed if i remember to take it along with me. I doubt the ticket price will be any different for perth. congrats foxy on your bball teams. I am finally get 1 of the best ZeruelXX nano figure after ordering back in december with some other chibi style figures. What other anime do you like? Naruto, Kochikame, Fullmetal Alchemist, Death Note, DragonQuest, Blue Dragon and quite alot more.